Is your home gradually leaning to one side? Do you notice your chimney leaning or your floors sloping? These are signs that you may have some foundation problems. A sinking foundation can mean big problems for your home and your budget. Foundations often sink and settle over time due to poorly compacted soil at the time of construction, large amounts of rain that cause soil expansion, or simply poor construction methods. 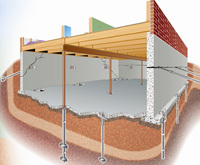 A sinking foundation most often means you need resistance or helical piers, or underpinning. Atlas Piers of Atlanta offers these solutions to Atlanta and the surrounding areas, and our service area is ever-growing. Windows and doors that won’t budge or are misaligned. Upheaval floors or sloped floors or badly cracked floors. Steel push piers and helical piers can really help your home’s foundation. These piers are installed in a process called underpinning, and they are designed to lift your foundation to its original position. 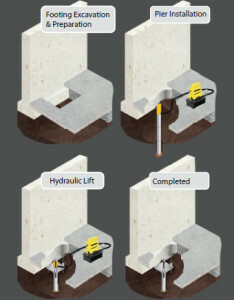 Because a sinking foundation will only continue to sink, helical and push piers are installed to provide extra support. They can be installed in any weather conditions and immediately begin lifting your foundation. Once installed, they transfer the weight of your home from the unstable, sinking soil beneath the foundation to harder, more compacted soil further down. These piers can be a big help in fixing problems associated with a sinking foundation such as leaning walls, cracked slab, water problems, and sticking doors or windows. Your sinking foundation may result in bowing or leaning walls, or even wall cracks. We offer a special repair service called carbon fiber repair. This is a “green” method to resolve your foundation repairs. It is also reliable, safe, and cost-effective. This strong material will prevent the need for additional foundation repairs for years to come, and is a great option for the earth conscious homeowner. Carbon fiber strips are attached to your wall with a high strength epoxy. This can be a great alternative to underpinning. Carbon fiber strips are barely visible and can be painted over. The strips can repair wall cracks and help strengthen leaning or bowing walls. If you notice that your foundation is settling bring in a professional for advice. Call us today to make your problem our problem. We take our work seriously and we will provide you with our best care. For all your sinking foundation concerns in Atlanta, we can put your mind at ease.